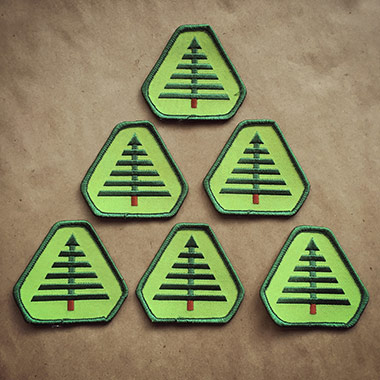 NEVER MET A TREE I DIDN’T LIKE: Our new “Thick Line Tree” souvenir patch! I like trees. Need to get out more. Out into nature. Into the trees. And maybe, just for my demise? I’ll work the rest of my life from my little DDC cockpit. Indoor living! And as the time for my expiration closes in, I’ll wander off into the woods to let the elements have their way with me. Alone, in the trees, thinking about that old tree patch I made back in 2015. Letting dirt, animals, insect, forest mist and trees devour me, releasing my spirit into the cosmos. Deep thoughts. And, does anyone know how the Wi-Fi is in the Mt. Hood National Forest? 02. Durable embroidery. Long lasting. 02. Inspired by Christmas trees Dad would drag in for Christmas, among other things. 03. 2-7/8” x 2-7/8” in dimension. 04. Proudly manufactured by the forest nymphs at Brewery Outfitters! 05. In stock forever, until we die in the woods somewhere. 07. Shipped in a durable kraft StayFlat envelope.